This is a very special week for us and I asked my dear friends from Mercer + James to come back and share their Top Anniversary Gifts! I think that it’s so great that I have no idea sometimes what to get Mike and there are people out there that are fantastic at this stuff. I hope you enjoy their picks as much as Mike and I have! As owners of Mercer and James, my hubby and I are constantly immersed in the search or creation of beautiful items for men. 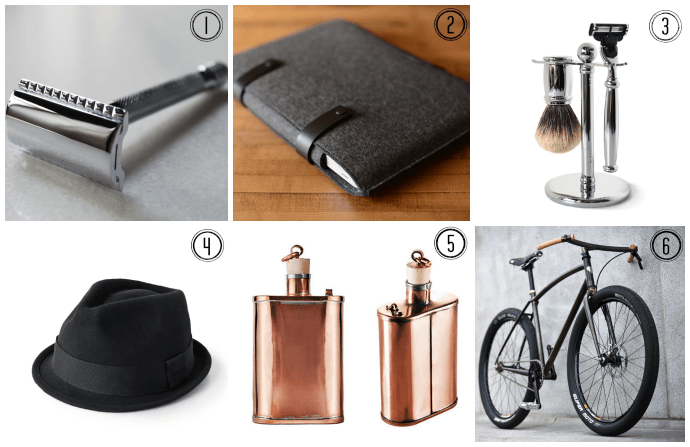 We live and breath everything we think is dapper or dashing, and so it was a particularly exciting opportunity when Carmen asked us to help mark her wedding anniversary by creating a gift guide for guys. While we have nothing against ties, we think that your significant other will get much more enjoyment out of a gift that both looks great and serves a regular utility. Below are a smattering of favorite items both from our collection, and from some of our favorite makers around the country. Have a very happy anniversary, and have fun giving a gift he’ll love every day! Our favorite thing about a classic safety razor isn’t that the closeness of the shave is unparalleled, or even that you’ll save money in the long run by only buying the small replacement razors instead of working through a mountain of disposables. The thing we love the most is much simpler – they’re beautiful. Each one is a shiny, carefully detailed, small piece of art that you use as a tool every day. Give one of these beauties as a gift, and both you and him will enjoy the results. If your boyfriend or hubby is anything like mine, his laptop is like an appendage. As a holder of every important image, video, and document, his laptop needs protecting! These felted wool sleeves are simple, chic, and durable, helping keep his technology scratch-free and looking good. They’re also made by hand in Minneapolis, MN! If he’s still shaving with an electric razor, you’re both missing out. Not only are electrics bulky and ugly, but they can’t get a close shave and even create irritation. As an easy upgrade, give him a great quality, solid metal shaving set that will look great in your bathroom and be more enjoyable to use. They even take readily available cartridge heads, making it a simple transition to wet shaving! We’re not suggesting that every guy should have a flask at hand, but if he does we hope it’s as fantastic as this one. These flasks have been hand-hammered in the USA by the Jacob Bromwell company since 1819, and are pure Americana. The trilby hat is our personal favorite from our collection of men’s hats. It’s the highest quality out there, yet comfortable and laid back. He can wear it with jeans and a t-shirt, or a suit and tie, making it an easy go-to all year long. This one is definitely our luxury recommendation, but it was simply too good not to share. Ezra Caldwell is an artisan in Harlem that makes unbelievable one-of-a-kind bikes with gorgeous detailing in copper and leather, many of them so stunning we’re not sure whether to ride it or mount it on our wall as art. Maybe both? If you’re looking for an amazing gift for a milestone anniversary, take a look at Ezra’s site and drool over the images of perfect toys for grown-up boys.